Over the last week I have had a number of call outs involving birds that have found their way down chimneys in the Cambridge area. This is quite common at this time of year as chicks are fledging and finding their way in the world. The only thing that the incidents below had in common was the type or lack of a proper chimney cowl or bird guard. Firstly I was called to a property which had a fly infestation in the lounge. The old fire place had been removed as it was no longer going to be used. A board had been inserted at the bottom of the chimney to prevent hot air escaping and ventilation holes had been made to avoid damp. However, a young bird had the misfortune to fall into the top of the chimney pot and had died on the board. The flies found it, as they do, and nature took its course. The escaping flies were exiting the chimney via the ventilation holes. I removed the board, removed the dead bird, swept the chimney and capped off the chimney pot and replaced the board. Two others involved stoves. One had this type of cowl which is really not suitable for a functioning appliance. The gaps between the bars are big enough to stop adult birds but not the young fledglings the size of starlings and sparrows. This was the occasion when a bird had fallen into the chimney. The other chimney pot was covered by a DIY chicken wire affair which had rotted through and was worse than useless at keeping birds out. Both of these had happy endings as I was able to catch the birds in the stove and release them. One was a Starling and the other was a Jackdaw chick. Again, the answer was to fit a proper British Standard compliant bird guard with a rain cap. Lastly a pigeon had fallen into a very old, large flue and was sitting on a ledge approximately 2-3 metres up. There was no chance of getting hold of it and it was certainly not coming down any further. In the end I had to get my biggest brush and slowly push it up the chimney. Unbelievably the pigeon stood on the brush as I slowly pushed it up the flue. I asked the customer to stand in the garden and let me know when it was out. They rushed in to say that the pigeon had exited the chimney, followed by a huge green brush, and flown off none the worse for its sojourn in their chimney. Again, all that was needed was the correct chimney cowl to be fitted. What to do if you get a bird down the chimney. If it is in the room already then close the door behind you and open the biggest window. Draw closed all of the curtains except the one in front of the open window. Leave the room and the bird will fly out on its own. Trying to shoo it out will just cause it to panic and fly around even more. If the bird is the firebox of the stove then turn out the lights and do as above with the windows and curtains. Then drape a sheet over the stove and gently open the door. Reach in and try to catch the bird, then cover it with the sheet. Take it to the open window and release it. If it escapes in this process then hopefully it will bolt for the open window. Finally consider fitting a proper British Standard compliant bird guard that is suitable for your appliance. 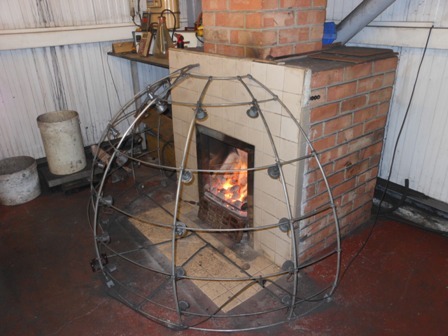 Remember gas and solid fuel/oil have a different specification of bird guard. If you live in the Cambridge area or Cambridgeshire then Sweepover Chimney Sweep can fit your bird guard or cowl for you. 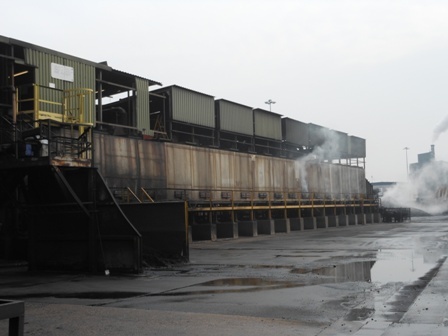 Recently I have been fortunate enough to visit the Coal Products Limited (CPL) Briquetting works at Immingham, South Humberside. The visit was proposed by the Guild of Master Chimney Sweeps and welcomed by CPL. It was open to all members of the Guild and we had members from as far away as Cornwall attending. The site is in the docks area and only 200 metres away from the dockside. We arrived with only a few stragglers and started off with a presentation about the works, its history, the process and the products produced. This was followed by a tour of the site. water as possible is recycled back into the production process. The hub of the production facility is the control room. Here the whole process is monitored both visually and electronically. Should there be a mechanical or system fault then there is build in redundancy to ensure that production continues. An onsite maintenance team is always available. Each batch is analysed in the onsite laboratory to ensure that it will meet the product description, consistency and performance parameters. The processing is surprisingly much like baking a cake. 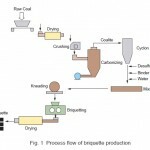 It comprises mixing, crushing, drying, adding some liquid binding agent shaping and then baking. The raw products are mixed together at various stages and the temperature is adjusted as required. 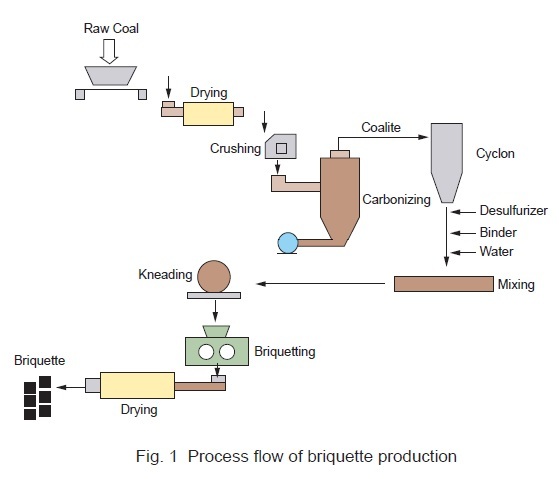 As with most things in life briquette production is a compromise to get the finished product. The skill lies with mixing the exact quantities of the various ingredients to achieve a consistent, specific product with the desired characteristics. Anthracite – naturally smokeless coal but difficult to ignite. Bituminous coal – has a high bitumen content and is 60 – 80% carbon. Petroleum coke – sediment left over from crude oil cracking. Binding agent – currently molasses. These will vary depending on the required product characteristics such as burn time, sulphur content, ease of ignition and so on. In addition the quality and chemical composition of the base product has to be allowed for and the mix adjusted as required. The raw coal and anthracite are mixed, dried and crushed.They are then mixed with the pet coke and finally the binding agent. Once the mix is completed the batch resembles a powdery black cake mix. 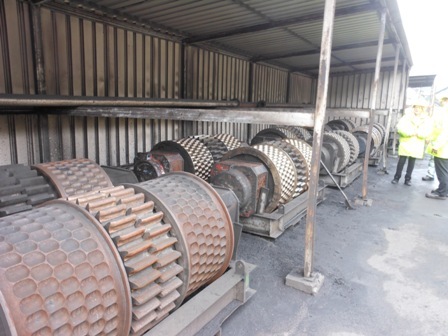 This mix is the run between pairs of large rollers or“tyres” which give a distinct shape and or marking. As you can see the tyres are big and very heavy. They have to be inserted into the heart of the pant and aligned perfectly to form the desired shape. They take hours to change so a specific fuel product run can last for days. 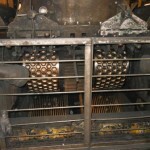 Some briquettes are formed into ovals such as Homefire and Wildfire and these will be further subdivided by a number of lines running around the oval. Others such as Ecoal 50 are hexagonal. 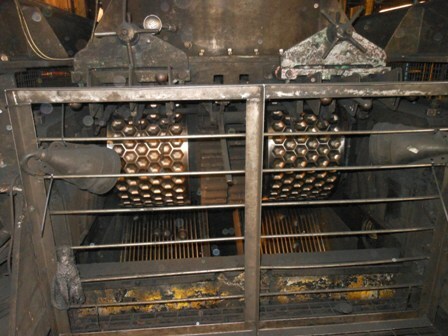 Once shaped the briquettes are run through a series of ovens which increase in temperature and bake to briquettes into the hard,dense form that we are used to. Once baked the product is cooled, to ensure it does not spontaneously combust, loaded onto lorries and dispatched for bagging. Remember do not use house coal in a stove, only stove coal. If you need more information about the types of stove coal or other fuel available available then visit the CPL website. I often get asked by my customers for advice on buying and installing a stove. So, below are a few key things you should think about before you buy a stove, which may save you money and make using the stove easier. How long do you intend to live in the property? Costs for a proper installation average out at about £1500. So it will take some time to get your money back on your investment. If you intend to move out in the next few years the value of the stove will not be reflected in the sale price of your house. Do you want to heat one room in the house, the whole property or a few radiators? Stoves are generally used to heat one room, but you can attach them to the central heating system, via a back boiler, to heat other parts of the house. You may wish to heat the whole house in which case you will probably be thinking of a biomass system. A crucial consideration for this is space for the fuel and the boiler. What size of stove should you get? If you are just going to heat one room then work out the volume of the room in metres and divide by 14. The resultant number is a general rule of thumb the Kw heat output of the stove required to heat the room. Factors that effect this calculation will be things like the age of the property, insulation in the walls, the number of external walls, north or south facing windows and so on. What type of stove should you get? This really comes down to personal choice. 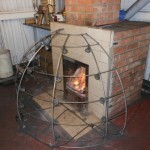 There may be cost saving and less inconvenience in fitting certain types of stove. If space is tight and you have a standard size fire place opening then an insert/built in stove may be an option. On the other hand if you have a large inglenook opening then a free-standing traditional or contemporary stove might be more appropriate. Try to visit a showroom and see them in real life to get a proper feel for how they would look in your house. Lining or use the old flue? There are many views on this and i could write for ages on the subject. My thoughts are that the stove will have been designed and tested using the size of flue recommended by the manufacturer, commonly between 125mm and 200mm, for optimum performance. The best type of flue is a narrow, tall, straight, insulated one which will increase draw and keep gasses warm as the flow out of the top of the flue. If you live in a forest then a wood burner would seem the obvious. However, a wood burning only stove can only burn wood. As the name suggests multi fuel can burn wood and smokeless coal. Wood and smokeless coal burn differently and the stoves are designed with this in mind. You’re choice on what fuel to burn may depend on what supply you have locally. Wood can vary in quality even if got from the same supplier at the same time. 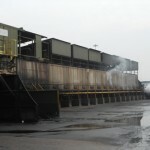 Smokeless coal on the other hand is a factory produced product so you will get far less variation in quality. There are a number of websites that list local fuel suppliers, (DK Till of Histon will deliver all types of solid fuel to your door). Running cost – fuel and spares? Figures from www. confusedaboutenergy.com and are a year old but it gives an idea of cost. 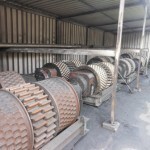 You will require spares such as replacement fire bricks, fire rope and perhaps glass, so have a look at and factor in replacement costs and how easy it is to acquire the items. A lot of towns and cities are smoke controlled areas, meaning you will need to get a Defra (Department for Environment, Food and Rural Affairs) exempt stove or only burn smokeless fuels, such as anthracite, on a multi-fuel stove. Check the Defra website to find out more, including an approved list of smokeless fuels. Here is a link to the smoke control area and streets by name in Cambridge. You’ll need plenty of room to store fuel, especially if you will be burning logs. Work on an average of about three to four cubic meters of space. This should ideally be outside but under cover that is easily accessible for deliveries. Smokeless coal comes in plastic sacks and can be stored in less rigorous conditions. All stoves installations must meet UK building regulations. Building Regulations, Document J, 2010 (free to download) is the regulation to comply with. For example, there are specifications around how the flue is fitted, the size of the hearth or the distance of the stove from combustibles and walls. These can all affect the type and size of stove you buy, so make sure you speak to an installer before buying. If installing it yourself you must get the Building Control Officer to ensure that the installation complies with Building Regulations. A HETAS qualified installer, by virtue of there training and qualifications, can sign off their own work to comply with Building Regulations. Find one for your area here. If you start to find twigs and other debris in your fire grate then there is a strong possibility that nesting activity is taking place. 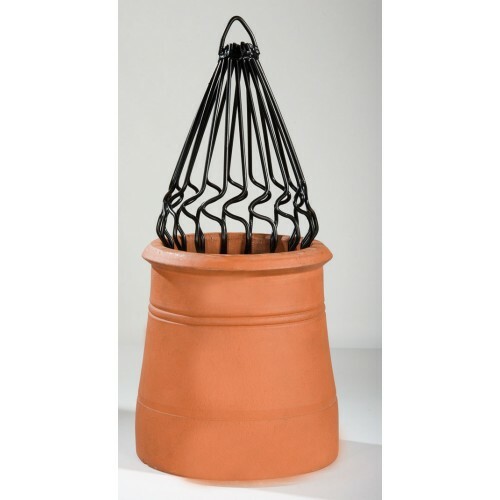 Take a few minutes to keep a watch on your chimney pot. 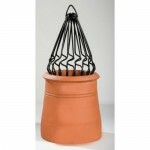 You will see the birds flying back and forth dropping or pushing material into the chimney pot. If you normally hear pigeons cooing or traffic noise and then it stops and all is silent there may be an obstruction in the flue. Do not try to light a fire and “burn the nest out”. You run the risk of setting the chimney on fire or filling the whole house with smoke. If it is in the early stages then get a chimney sweep in immediately you suspect nesting is taking place. If you leave it to the middle of March it will be too late as it is an offence under the Wildlife and Countryside Act to destroy or remove a nest while it is in use. You will have to wait until the end of August to remove the nest. Get the chimney swept and a proper British Standard/EU compliant bird guard fitted for your appliance. There are different type for gas, oil and solid fuel. This is a very physical and time consuming job. All loose material at the bottom of the flue is removed. The nest is then broken up using a hard, small hard brush or a metal nest removal tool. Eventually the size of the brush is increased until the nest is completely removed. Ask the sweep to let you see the brush coming out of the pot. Also ensure that he does a smoke draw test at the end of the procedure. Quite often as the nesting season progresses the twigs dry out and shrink. As they do the weight from above, the mud and the chicks can cause the nest to slip down the chimney. It only has to fall a short way before the birds cannot get enough lift to fly out. They die in the chimney. A summer progresses nature and the flies do their business and quite often there is an over powering smell and or a plague of flies in the room at the bottom of the chimney. The fly infestation normally lasts about 3 – 7 days. Nesting season is mid March until August or when the chicks have fledged. Signs of nesting are twigs at the bottom of the chimney; a lot of activity around the pot; the chimney becomes quiet. If you suspect nesting do not try to burn it out but get a sweep in to remove it. Then immediately fit a proper bird guard. A fly infestation is often a sign of a collapsed nest or a dead bird in the chimney. 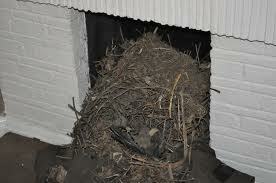 For more information on bird nest removal contact Sweepover Chimney Sweep. Sweepover removes nests and fits appropriate cowls in buff and terracotta. Urgent! Call this telephone number. They have just had a chimney fire. That was the text from my office manager. So I pulled over and gave the number a call. I spoke to the customer who explained that they had just moved into a house that week and had lit a fire in the downstairs front room last night which resulted in a chimney fire. Could I pop around and have a chat. As it was a quiet day I was able to get there within and hour. The client then gave me a full briefing on what had happened. To be quite honest I struggled to understand and believe what I was being told. As mentioned above the young couple had that week moved into the house with their two young children. As it happened the two young children had stayed at their grandparent and arrived in the new home that day. It was explained by the client that they had three flues, rear downstairs with a DIY installed stove, and open fire in the front down stairs room and a sealed of fire in the upstairs front bedroom. The night before they had lit a fire in the downstairs front room. An hour or so later they could smell burning upstairs and on investigation found that the front bedroom, directly above the room with the fire in it, was full of smoke. The smoke was coming from behind the boarded off open fire which now had a gas fire installed in front of it. They immediately called the fire service who arrived in minutes and dealt with the fire. The fire service then conducted an inspection of the chimney which revealed that all three flues had been knocked into one large flue in the attic area. Over the years debris had fallen behind the asbestos board in the bedroom. When the fire was lit downstairs some form of ignition took place and set fire to the debris. When I had a look up the flue of the upstairs bedroom you could see out of both the front two chimney pots. There a vast cavern like opening just above the ceiling. Either the feathers (bricks separating the flues) had been removed deliberately or had fallen down and then been removed. None of the flues had been swept in years and to be quite frank they were all dangerously dirty. The result is that none of these flues can be used without either being repaired of relined. There were no smoke alarms in the house or Carbon Monoxide alarms in any room where there was a fossil fuel burning appliance. The bedroom where the fire was, i suspect you have guessed already, the children’s bedroom. 1. If you move into a house that has been lived in before and the previous owners can not provide a recent sweeping certificate get the chimney swept and inspected by a qualified and competent chimney sweep before you use it. The Guild of Master Sweeps website has a post code search facility that will put in touch with your nearest sweep. 2. If they are not hard wired in then get some battery operated smoke alarms and and Carbon Monoxide alarms. Every room where there is a fossil/carbon fuel (coal, gas, wood or oil) burning appliance should have a Carbon Monoxide alarm correctly fitted in it. If battery operated then you can take it on holiday with you. 3. Know what to do if you have a chimney fire. If in doubt call a chimney sweep. Welcome to the blog of Sweepover Chimney sweeps. This is where you will find all of our latest news and special offers. Be sure to check back regularly to keep up to date.